After waiting two full weeks after Missouri started its practice Kansas got in on the act Monday. Schools across the Metro hit the field as practice opened for all Kansas schools. For two schools in the Metro the first day of practice meant the first step to repeating as state champs. Shawnee Mission East and Bishop Miege both won championships last year and look to be among the favorites again this season. East capped off a perfect season with a 33-14 win over Hutchinson in the 6A championship game. Now that they have the title the Lancers could be seen as the target for many schools on their schedule and throughout the state. East coach Dustin Delaney said his squad opened practice with the same mindset as before. “I love the first day just getting back in the football season,” Delaney said. “Missouri has been doing it for two weeks so us Kansas coaches have been so jealous. To come back and be with the guys again it’s a great feeling. 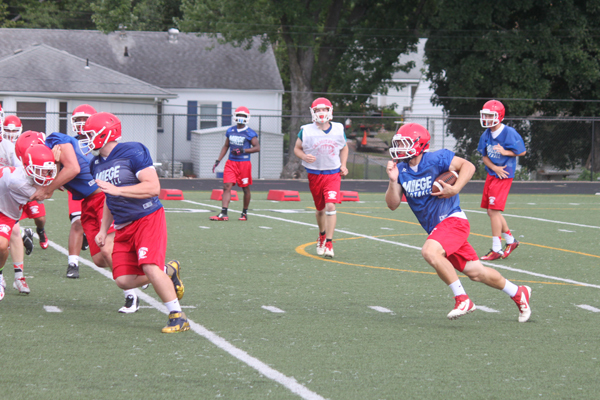 At Miege some key players off the 13-0 squad are gone but many return. The Stags were the favorite heading into last year in Class 4A and look to be that way again. During a spirited opening practice Miege coach Jon Holmes said he knows his team will be the measuring stick and they accept the challenge. “The first practice of the year is always a fun practice,” Holmes said. “For us our guys the last time we were on the field was the state championship and I think the guys like the way that ended and they are anxious to get back out there and do it again.